Certain mantras are to be cherished like a beautiful gem. The Siri Gaitri Mantra is just such a jewel. It is unique, and it captures the radiant healing energy of the Cosmos as a gem captures the light of the Sun. Like a gem it can be put into many settings for different purposes and occasions. When Yogi Bhajan first shared this technology he gave a series of meditatins that use the inner dynamics of this mantra. If you master any of these practices you will be rewarded with healing and awareness.The mantra is also a Sushmuna Mantra. It has eight sounds that stimulate the kundalini to flow in the central channel of the spine and in the chakras, accompanies by matabolic adjustment to the new level of energy in the body, and balances the five zones of the left and right hemispheres of the brain to activate the Neutral Mind.The mantra uses a sound current. The sounds create a juxtaposition of energies. Ra is the energy of the Sun: strong, bright and hot. Itg energizes and purifies. Ma is the energy of the moon: receptive, cool, and nurturing. Da is the energy of Earth: secure and personal. It is the ground of action. Sa is the impersonal Infinity. The cosmos in all of its dimensions openness and expansivness and totality is Sa.Then the mantra repeats the sound;this repetition is a turning point. The first part of the mantra is ascending and expands into the Infinite. The second part of the mantra pivots those qualities of the highest and most subtle ether, and brings them back down. It interweaves the ether with the earth.Sa is the impersonal Infinity. Say is the totality of experience and is personal. It is the feeling of a sacred "Thou." It is the embodiment of Sa. So is the personal sense of merger and identity. Hung is the Infinite, vibrating and real. The two qualities together (So and Hung) mean: "I am Thou." Sit in an Easy Pose with a straight spine, and a light Neck Lock. Have the elbows tucked comfortably against the ribs. Extend the forearms out at a 45-degree angle out from the center of the body. The palms are flat, facing up, the wrists pulled back, fingers together. 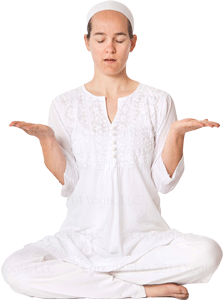 Consciously keep the palms flat during the meditation. Sing the Siri Gaitri mantra, which consists of eight basic sounds: Ra Ma Da Sa Sa Se So Hung. Pull in the Navel Point powerfully on the sound Hung. Forcefully clip off the sound Hung as you pull in the navel. Chant one complete cycle of the mantra on a single breath. Then inhale deeply and repeat. Move the mouth fully with each sound. Feel the resonance in the mouth and the sinus areas. Let your mind concentrate on the qualities that are evoked by the combination of sounds. Inhale deeply and hold the breath as you offer a healing prayer, visualizing the person you wish to heal (including yourself) as being healthy, radiant, and strong. Imagine the person completely engulfed in healing white light, completely healed. Then exhale and inhale deeply again, hold the breath and offer your prayer. Then, lift your arms up high and vigorously shake out your hands and fingers.